We just launched a new notification system on Shutterlife that will make it easier to see all the awesome stuff happening around the site with the community. You can keep an eye on the globe icon near the top-right of the site to see if you have any notifications, and you can keep reading to learn more about them. Right now the notification system will show you a handful of events for people that you follow on the site, and a few other things when people interact with your content. So if you're not following any one yet, you might not see a lot of notifications. We recommend checking out photographers on Shutterlife and following a few who catch your eye. Once you do, you'll start seeing events like the following popping into your Notifications. Notifications are basically broken down into a couple categories. First up is the activity of people you're following. Whenever someone you follow uploads a photo, you'll be notified so you can check it out. Whenever they add an item to their Camera Bag or Wishlist, we'll let you know so that you can see their new gear. This will help you keep up with all the latest and greatest in their photography life. 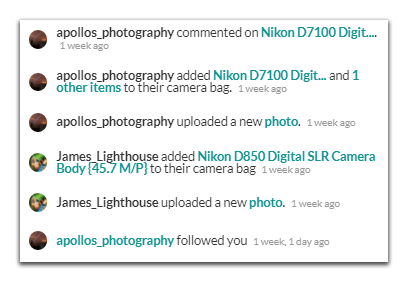 On top of that, there are notifications provided any time someone interacts with your content or gear. Specifically, if someone follows you, likes or comments on your photo, or comments on an item you own, it'll pop up in your notifications. That means you'll get great feedback on your shots and maybe even learn some tips and tricks (or answer a question) about an item you own. We plan to add even more types of notifications in the future, so if you have anything in particular you'd like to see, please let us know. You might also see site announcements or special features popping up in your notifications if it's something we think you'll be interested in seeing. All that said, we hope you enjoy the new Notifications feature. We're confident it'll make Shutterlife a more enjoyable, engaging, and friendly community!